Over the past 10-15 years, the practice of user experience within organisations has matured significantly. But why do some organisations get more benefit from UX than others? The answer stems from how UX is positioned within the organisation, how the organisation measures the success of its investments, and how UX groups seek impact. Those who report having a high degree of impact behave differently to those with low impact. This is the second in a series of fundamental user experience concepts useful for understanding people’s behaviour when using the web and mobile. First, think of your first name. Now, think of the last letter of your surname. Neither of these are difficult tasks, but it takes longer to complete the second than the first. This is an illustration of the difference between conscious and unconscious thought. While your first name springs to mind immediately, you had to work a bit harder to come up with the last letter of your surname. Meanwhile, when you were completing the tasks you had to switch your attention from this page to the task and back again. In doing this, you had to adjust what’s called your “locus of attention”. This is the first in a series of fundamental user experience concepts useful for understanding people’s behaviour when using the web and mobile. The paradox of the active user is a concept that was first articulated by John Carroll and Mary Beth Rosson in 1987 at IBM’s User Interface Institute [PDF]. It describes a phenomenon that is ever-present, and still relevant to the way that people use the web and mobile devices today. Is user experience really expensive? While the market for user experience consulting has continued to grow over the last five years, some organisations are only taking their first steps in prioritising investment in professional user experience consultancy. And it’s often these organisations who need it most – charities with internal disputes about their brand and what to publish online; small businesses who have a world of opportunity at their feet but apparently no money or time to grasp the nettle; local authorities who struggle to separate internal needs from user needs, and therefore navigating and reading their content is frustrating. This week on t’internets the Twitterati have been set alight by the hype surrounding the “design” of Apple’s new iOS – version 7. I say “design” because many of the commentators have been quick to highlight the aesthetic qualities resembling those of Apple’s key competitors, whether they be Google’s Android or Microsoft’s Metro UI schemes. To my mind these debates are inevitable but unfortunately lack much in the way of value. The debate lacks purpose because after a while, and specifically for interfaces that are often used, aesthetic aspects become secondary to utility. It’s also been proven that UX designers themselves are very poor judges of the quality of an interface based on looks alone (see Dillon and Black, Aesthetics and user performance [PPT]). That is not to say, however, that aesthetics are not important. It is more that aesthetics are just one element of the experience and should not be assessed in isolation. Aesthetics and emotion in digital interfaces is a topic that is endlessly debated in UX circles. Stephen B Andersen in particular makes a good case for how aesthetic excellence creates a more emotive bond between your product and your customer, and how brand also plays a role in helping people forgive disappointing functional design or lack of utility. And while aesthetics are important, there are so many more important topics to focus on. It’s a shame, for example, that the aesthetics debate around iOS7 will most likely cloud the very interesting direction Apple is taking towards integrating its mobile devices and its laptop and desktop machines. 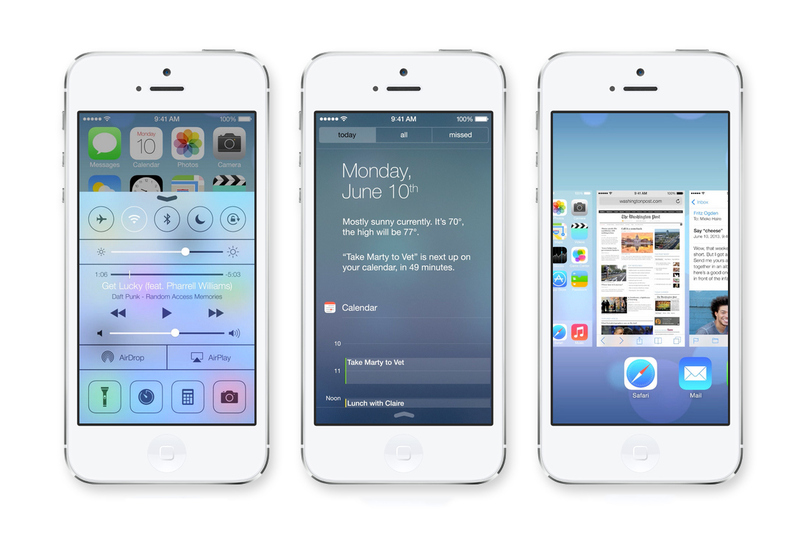 For me, these are the new parts of the Apple user experience that will have lasting impact once the new OS appears. There aren’t so many pretty pictures to accompany those, unfortunately. And so, the blog and tech journo hype machine rolls on to the next big launch. We will have to wait until the autumn to see whether iOS really improves the user experience. When you design a website for a company, you are just a cog in the overall machinery of a business. This machinery is what I’ve been trying to get my head around of late, as the opportunities for ‘digital’ driving customer experience improvements start to impact on all customer-facing areas of the organisation. 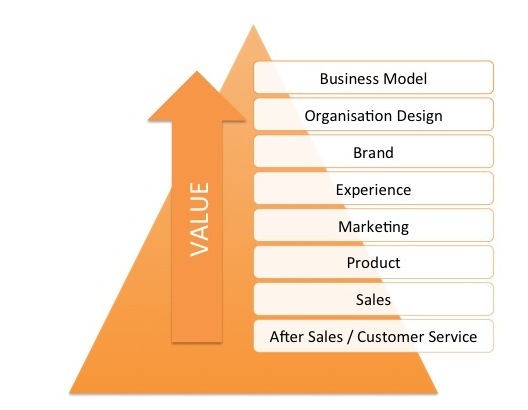 I’ve rationalised my thinking into my understanding of the Customer Experience Value Chain. Being part of the team who designs a company’s website, you are likely to be working for the marketing group within the business. This puts you right in the middle of two competing areas of value for the organisation – moving down the chain to drive short term revenues from Sales, and moving up the chain to the long term strategy focus of brand and business model. As a web designer, it’s likely you can’t have any influence on what product or service the organisation is selling. But you can ‘position’ that product or service in a way that makes it more attractive to people – by leveraging the brand (which is usually already defined for you). You can make the sales process slicker and remove the obstacles to conversion. You can help customers self-serve their support requirements and give them more transparent access to the Customer Service team. But still, you’re still just a pawn in the organisation’s game. This is no excuse though. Being unmotivated and doing a bad job won’t give you greater influence. To have more influence you need to move up the value chain. By reaching beyond the traditional Marketing sphere and focussing on the Experience, you can take a holistic view of all of the interactions and touchpoints your customers have with your company. You can look to optimise those interactions and have a positive impact on customer perceptions of the Brand. This, in my view, should be what Marketing is tasked with delivering, but in my experience too often Marketing is too closely linked with more commercial functions like Product or Sales, which diminishes its impact and value. Being involved in defining a brand is possibly the holy grail of marketing. In an ideal world Brand drives internal culture which in turn drives the ways in which the company’s staff behave when dealing with customers and how the company listens and communicates. No self-respecting UXer would deny that Brand is a key input to defining Experience. But possibly an even more influential role in defining and supporting the experience is Organisation Design. Management consultants and UX people the world over are often heard bemoaning how the siloed nature of our traditional ‘factory-minded’ company structures effectively prevent the collaboration and innovation required to deliver great customer experiences. It’s a CEO’s role to shape the organisation’s reason to exist, how staff are organised and how departments work with each other to produce the outputs required to deliver profitable growth. Business Model and Organisation Design go hand in hand. What to take from all of this? Building great customer experiences starts with the Business Model. Asking the CEO “what business do you think we’re in?” may lead to some interesting conversations. So I think UX people need to think bigger – don’t moan about the organisational design or the business your company is in. Go and find out from the CEO how you can start having an influence higher up the Customer Experience Value Chain.